Yep the title says it all. But let me give you the story of how I came to quit my guild this weekend after two years. I started playing WOW in January of 2007. Being a complete noob with no idea of end game content, talent trees, racial abilities or much of anything else I rolled myself a human paladin. Somewhere in my teen levels I'm running thru westfall and someone asks if I want to join a guild.... "what's a guild for?" I ask. "A group of people to help out with leveling, questions, etc" I hear back. "OK sounds good" and I'm invited to Legion of Light. At the time I was about 10-20 levels beneath most of our guild and it seemed like all the core members had a ton of info and were always willing to help out with hard quests and such. It was a very supportive group. 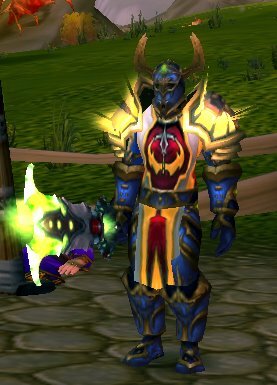 Eventually I reached 60; but by that time The Burning Crusade expansion had come out and most of the guild was well into it, so again I make my way to BC 5-10 levels behind most folks and one day I finally hit 70.... I'm all decked out in greens and I think to myself "yay I finally beat this thing" probably nothing left to do, maybe try a new character. Man was I wrong lol ! Turns out I really got a kick out of PvP...My guild however was all PvE. This is where the first crack appeared. Folks would ask me to raid with them, I'd rarely go instead focusing on arena matches and battlegrounds. Occasionally I'd get a few guild members together for 5v5 arena but their gear wasn't right and they had no idea of valid combo's classes, strategy etc. Season 2 came and went, Season 3 was in full swing... I was content to do my pvp thing and my guild was content to not push me into pve. However there was a problem with the guild.... Our leader was getting frustrated with people not showing up to raids, lack of progression etc. After a month or two he left the guild and took some people with him. WOTLK hits and for a while the guild has more people on then I've seen in months, but this soon dwindles and another large chunk of people leave the guild looking for more active PvE content. During the last couple months I found just 3-5 people on at any given time. A few weeks ago I found myself the only guild member on almost every night. I found out that the majority of active level 80's had transferred to the new Borean Tundra server and merged with a guild there. Loyalty had kept me with the guild for a long time, longer then it should have probably. But it's one thing to not participate a ton in a group and another for there to basically NOT have a group. So last week I managed to find 3 long time members online at once and took the time to explain that I would probably be leaving for a pvp oriented guild, and my reasons for it. They understood, and frankly I think they knew the guild was about dead. So on Saturday I bid a fond farewell to my guild with the little used /gquit command, ending two years with Legion of Light.... What happened after? Am I solo, did I join a new guild? Check back tomorrow to find out. Leaving a guild where you have been a long time and developed your skills is always hard. Loyalty is something not easily found. However, what is even harder to find is people with a clear mindset on what they need from the game. And subsequently guilds with a clear and defined purpose. It seems that of all players knew what they want from the game, knew that they can not achieve everything and came together in guilds, the latter would have a clearer purpose. What I did is define exactly what I want from the guild and searched for it. And found it. And because of that I am willing to accept any 'quirks' my guild may have. Good Luck!